Discussion in 'General Discussion' started by Umberto, Apr 12, 2018. 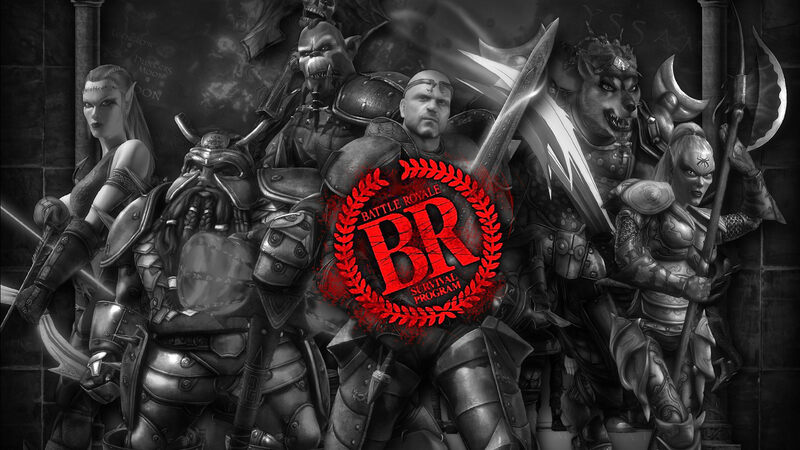 The Discussion thread for Rise of Agon's second Battle Royale event. Arrive at Espenhal for ~2:30pm EST. Do not attack anyone in the area. Remove all items from inventory (GM's will be verifying). Take the provided Nexus Entrance to the waiting area. You may quickly relog after porting through. Once you're back in game, /rest with your character, and wait. The Nexus will be destroyed at 3:01pm EST sharp. All characters will be resting at the waiting area in a line. Please don't be running/jumping around. GM's will check each character's inventory to ensure no one has items. Runestones will be traded to each player. Keep Public chat open. On the 3rd Mana Missile, you may start your Runestone. Anyone starting early will be knocked back and be forced to teleport late. Anyone causing chaos or knocking people back will be banned from all future events and given a temp game ban. The Battle Royale officially starts when you load in. Run around, look for items, and fight! Good luck. Kalos, NonFactor, Myater and 6 others like this. Is the FPS bugged fixed? If not, doing 2 different ports maybe even 3 (if they use a runebook to get to Espenhal, nexus and runestone) will cause a lot of the players to get the fps bug. No logging out and logging back in. This rule applies even if a player experiences the FPS bug. We will not pause the event to allow people to relog. And seeing how this is a rule, I would bet ~10-20% of the players start the event with the FPS bug due to the 2-3 ports and just die wasting their time. Nat, MerleisAirdburne, MaxiHori and 2 others like this. Players will be able to relog after going through the nexus. So there will only be 1 port before the event starts. Myater and Fengor like this. My point is it's just tedious is all. It can still happen after just 1 port as well. Maybe drop it down to 5% of the people going tho will start off with the bug. The bug should be a top priority to be fixed as it should have been when it first started happening. It's been in the game for so long and with event like these you're just going to see people complain about the bug just as what happened in the first event. I'm still gonna be going because obviously it'll be fun as long as the bug doesn't happen. But it's almost a 100% guarantee some people will get it and it will ruin their experience. zander and NonFactor like this. Of course it's tedious, believe me I understand that. The devs are working on it, and that's all I can say. Is it possible that a player may experience it? Yes. Should we hold off events until it's fixed? No. There's no set date it will be fixed by, it could be tomorrow, it could be next week, I don't know. The point is, I don't plan on waiting for it, I will continue to host events as long as the majority of players enjoy them. On another note: Anyone caught helping someone evade a ban to participate will be temp banned from the game, as well as from all future events. Kalos, Fengor, MerleisAirdburne and 1 other person like this. Event is tomorrow! Don't miss out. The Battle Royale is capped at 80 players, so if you want a spot, be there early. Nexus Entrances will be placed at Espenhal at 2:30pm EST. Anyone tampering with them will be temp banned from the game. We'll have GM tools to make this process a lot easier in the future, but for now we need to make due with what we have. Please remember to port through the Nexus Entrance without any items, and once you're though you must put your character in rest mode. Thanks, and see you there. Another update: Players will be starting with a small amount of regs, arrows, food, and a shield. Until we have more GM tools to create proper BR events, I don't want a good chunk of players dying quickly simply because they couldn't find regs to fight back. Next time you use gm nexus, lower CD to like 10 seconds instead of 1 min. This wasn't a battle royale, it was a FFA with the unnecessary step of picking up items and waiting for 2 hours to make sure we start naked. Overall, the event went very smoothly. Thanks to all for participating! And congratulations to Miss Black (roflmao lol) for winning. Be sure to PM me to discuss your reward. There's a massive list of things I'd like implemented to make events easier. This change wasn't able to be made in time. Hopefully for next time we won't even need a Nexus. I didn't want players dying because they didnt have regs to fight back. Until we have the GM tools to properly host a big event, this is one of the drawbacks. The eventual goal is to host pure BR's. Hosting an event of this magnitude is extremely difficult, so that's why the next one will mostly likely have more GM capabilities for support. I don't think my blood pressure can handle another event without them. And a big thanks to the two GM's who helped out. It's much appreciated. Wes Furtive, Fengor and Metalkon like this. Some ideas that would help it be better, idk if technically feasible. 1. Remove name and clan tags and mini map clan dots. 3. Give titles from BRs a slight buff during the fight itself (survivalist gets +1 per tick on xfer for example). Play area way too small in my opinion. I liked the ones on like Skull Island or something.